During general election of 2014, students of our country were hoping for a change in the policies at the centre because there was great anger against the UPA government’s policies during the last ten years. New government came to office on a high note and media was busy in projecting a new era in Indian History. Our prime Minister on various occasions in his vibrant and imaginary speeches also promised big changes. Gradually time has passed but nothing has changed on ground, apart from repetition of speeches and declarations. After this span of six months public of the country along with students’ community is facing the heat of the same anti-people policies like the UPA government which are being pursued with even greater pace by the BJP-led NDA. Our Prime minister is mostly busy in foreign visits and state elections. But even in his busy schedule whenever he finds time he attends parliament to introduce anti people polices. Generally he loves to do this through ordinance passed in cabinet without discussing it in the parliament. It suits their ideology as well as saves them from the discussions and questions of representatives of largest democracy of world. In the last six months there has not been any appreciable growth in GDP, problem of price hike remains unaddressed. BJP government has showed its commitment to foreign finance capital and cap on foreign direct investment has been increased in defence, insurance, health, while coal, railways and other sectors are on privatisation agenda as well. BJP is busy to distract the attention of common public from these agendas through religious polarisation, issues like Love Jehad and Ghar Vapsi. In fact RSS lead BJP is creating such an environment throughout the country where people are not able to identify root cause of their sufferings. Leaving aside all present problems there is an emphasis to glorify our past. For this they are ready to rewrite history. To hide the weaknesses of our social composition, blame is given to the invaders or more precisely to other religions. This is the reason when RSS family is championing the idea that root cause of sufferings of the dalits in India is the miuslim invaders in our past. Otherwise it is known fact that this saffron brigade is very much committed to the Chatur Varna and Manu Samriti. In the education sector also BJP government is pursuing the same agenda of commercialisation. But more dangerously central government is also taking agenda of communalisation of education very seriously. Enrolment levels are high in primary education covered under Right to Education (i.e. 6 to 14 years), but there is high dropout. 15.9% of boys and 17.3% of girls of age 15 to 16 year olds are currently out of school. 27% students drop out after V, and 41% drop out after VIII. According to the official census of 2011, 8 Crore children are out of school. Students who are going to school even those can’t be said to in the right track of educating themselves. This is reflected buy the achievement level of students revealed in ‘The Annual Status on education Report 2014’ of NGO Pratham. According to ASER in 2014, in class III, only a fourth of all children can read a class II text fluently. This number rises to just under half in class V. Even in Standard VIII, close to 75% children can read class II level text (which implies that 25% still cannot). For maths also in 2014, at 25.3% of class III children could do a two digit subtraction. For Standard V children, the ability to do division is 26.1% in 2014. The percentage of children in class II who still cannot recognize numbers up to 9 has increased over time, from 11.3% in 2009 to 19.5% in 2014. In 2014, about 25% of children enrolled in Std V could read simple English sentences. This number is virtually unchanged since 2009. Std VIII could read simple sentences in English (2014,) this figure is 46.8%. In higher studies Gross enrolment rate is 20.7%. The GER for males (22.1) is higher than GER for females (19.4), resulting in the gender parity index (GPI) of 0.88. There are a total of 687 universities across the country, with state public universities constituting the highest share (44.5%). Out of this 344 are general universities (55.4% of total), 88 technical universities (14.2%), 68 other universities (11.1%), 38 agricultural universities (6.1%), 29 medical universities (4.7%) and 18 law universities (2.9%) with all other universities comprising (5.6%). India has a total of 34,852 colleges (7.7%). Apart from this there are 11,157 stand-alone institutions. Stand-alone Institutions are those that are outside the purview of the university & college and they require recognition from one or other statutory bodies. As can be inferred, the highest share of enrolment (81.7%) is at under-graduate level, followed by post-graduate (9.1%) and Diploma (7.6%), with all other levels forming only 1.6%. If we analyse this enrolment in relation to our social structure we will find a different picture. Females are 48.5% of the population of India but their enrolment as student is only 44.6%. The GER of SCs is 12.2% which are having 19.9% share of population and STs is 4.5% having 8.6% share of population. Same trend is seen for OBC and Muslim minorities, OBC’s are 42.3% of population having 30.1% of enrolment and Muslims are 12.9% of population having 7.0% of enrolment as student. Not only in enrolment as students but as faculty and non teaching staff, these social differences are reflected. Females are only 39.0% of teaching and 26.8% of non teaching staff (48.5% of population). SC’s have 6.9% of teaching and 12.4% of non teaching staff. ST’s have 2% of teaching and 3.5 % of non teaching staff. Muslims are 3.1% of teaching and 3.2 % of non teaching staff (Annual Status of Higher Education of states and UT’s in India, 2014). Our MHRD minister is continuously campaigning for new education policy. But till now there has been no discussion on the form and structure of this new education policy. May be it is being planned in closed doors under the chairmanship of Dina Nath Batra. But primary indications are conveying that this so called New Education Policy will only be the extension of old agenda of privatisation adding a fresh flavour of saffronisation. After the withdrawal of Four Year Under graduation Programme in Delhi University with active involvement of UGC and MHRD, there were impression that long struggle of students and teachers of Delhi University will be successful. Next step this process was the removal of Vice Chancellor of Delhi University as enough proves were provided to UGC and MHRD about his financial and administrative corruption along with his undemocratic style of functioning. But quite amazingly VC has managed the ministry by pleasing RSS persons through various social functions, where these RSS functionary were invited as guests. Also it looks like VC has given commitment to implement the agenda of safronisation of education. MHRD has taken a U turn on his position and has issued a notice to universities to strengthen semester system and to implement ‘Choice Based Credit System’. This CBCS is nothing but the blue print of the provisions of FYUP to be completed in three years. This reflects the commitment of this government to the same agenda and withdrawal of FYUP only a political stunt. The CBCS is only a cafeteria-approach based system which is designed facilitates “seamless student-mobility” between courses and universities. It is identical in its course structure to the FYUP (repeat pattern of Foundation, Core and Elective Courses), except the fourth year. It will lead to continuous fluctuation and flux in workload, particularly in light of the fact that there is no proposal to change the rigid workload norms for creating teaching posts. Basically this system is designed on the basis of American system which runs on students’ loan and on the shoulders of add-on professors (contractual). This is only to woo and facilitate the foreign institution in India. Any discussion education is not complete without the mush problematic campaign ‘RUSA’. There is much discussion on the provisions of RUSA. But the experience of its implementation has proved our concerns. In the states where it is fully implemented like Himachal Pradesh and Assam, there a colossal discontentment is there in student and teaching faculty. whole of the education process right from class room teaching to evaluation of examination is in pathetic condition. In Himachal Pradesh students have been awarded scores of 70% without even appearing in the exams. There are gross irregularities. Numbers of teaching hours have drastically reduced. There is very less time for co curricular activities like sports, culture, NCC and NSS. We have already witnesses a broad based and very strong opposition to this scheme. But BJP government is not ready to take any lessons and is on the same way of last central government. Implementation of CBCS is also a step in this direction. Indian education system is already over commercialised, which is having adverse impact on the reach of students from poor and middle class. An important step for commercialisation of education was taken by the last NDA government when in 2004, just before its electoral defeat, the BJP-led coalition compromised a constitutional right and offered education as a consumable commodity to the World Trade Organisation General Agreement on Trade and Tariff process, thereby drastically diluting the state’s responsibility in education and opening the door to privatisation. Presently contrary to the general belief our education system is running by the private players whose motive is only to cater degrees and earn profits. There is rampant privatisation of education in India which is replacing the government education system. It is quite deliberate on the part of successive governments which provided favourable environment to flourish these private players and extract huge amounts from the students. Even after the implementation of Right to Education through long struggles the pace of privatisation is on increase. This private education is not only commercial but also unequal as private schools never follows the norms of social justice. This privatisation is on continuous rise. In the year 2005 there were 17% private school in rural India. This percentage rouse up to 27% in 2013 and this number has reached to 30.8% in 2014. Percentage of girls and boys clearly conveys the impact of privatisation of education on girls. In 2014, in the age group 7-10 years, 35.6% of boys are enrolled in private schools as compared with 27.7% of girls. For the age group of 11-14 years, 33.5% of boys are in private schools as compared to 25.9% of girls. The pace of privatisation is more rapid in the area of higher studies. More than half of the students’ enrolled in higher education today are under private educational institutions. 66% of students in general education and 75-80% in technical education are enrolled in private, self-financing institutions (Planning Commission document, 2013). These institutions are taking huge fees from the students apparently students from the backward and poor sections are not able to access these institution. These private institutions either in primary sector or higher education are not ready to implement the provisions of social justice like reservation. There is no control over the admission process and fee structure by the governments. Recently in Delhi NCR, court has given freedom to schools to decide their admission parameters. There is a provision of admission of economically backward candidates in these schools but it has become another way for money making. Most of the seats are vacant in the schools. Commercialization of education has already led to huge distortions in the educational landscape, both social as well as spatial. Education priorities cannot be left to vagaries of market forces. Commercialization entails that quality education becomes synonymous with affordability. The goals of equity and inclusion, the fundamental pillars of policy making in any democracy, might be the first casualties if unbridled profit making is instituted as a norm for the educational institutions in the private sector. Private education widens inequalities not only in education, but also in economic and social spheres. After all, no private institution in India will be ready to promote equity on a satisfactory level, grant access to the weaker section, or provide liberal scholarships. Education loans have replaced scholarships in policy discourses on higher education. It is argued that even needy students need not be given scholarships; instead, they can be asked to go for education loans. Communalisation of education for communalising the whole society is an integral part of the New Education Policy of Human Resource Development Minister Smriti Irani as introduced by her in a symposium titled 'Restructuring of our education system with Bharatiya perspective of values' in Hyderabad. According to her Indian education policy is not relevant in present time so “a new education policy is required to build a resurgent nation which would be stronger, resilient and humane”. This new education policy is much inspired by the ideological source of RSS i.e. Hitler who believed in the phrase 'catch them young'. The Nazis lead by Hitler also had done similar experiments with education system and had changed the entire educational syllabus to pursue their agenda of racial hatred and Aryan supremacy. If we analyse the developments of last six months this intension of RSS/BJP becomes clear. Much has been discussed about the political commitment of BJP to this agenda and acceptance by BJP leaders in open and even in parliament. Using education to corrupt the future generations is an art that Hitler had perfected with the phrase, 'catch them young'. The Nazis had changed the entire educational syllabus to pursue their agenda of racial hatred and Aryan supremacy. It is the same phrase and similar ideology that inspires RSS and BJP to use education as a tool to indoctrinate the young minds with communal venom. Leaders of the BJP are on record announcing their intention to change the textbooks and syllabus. Special incharge for this project is Dinanath Batra, National President of the RSS-affiliated Shiksha Sanskriti Utthan Nyas (SSUN). We are not discussing here Batra’s views and content of books written by him which are presenting a whole new science and history in front of students with a specific communal agenda. In the last NDA government these kinds of efforts were also there. But present BJP government is much more aggressive and staunch. Because presently Prime Minister is heading the comparing and teaching new science not only to general public but also to the topmost doctors and scientists of India. Prime Minister Narendra Modi, while addressing a group of scientists in Mumbai, claimed that organ transplantation was known in ancient India-he gave Ganesha with his elephant head and human torso as an example. Surprisingly nobody was there to resist the statement. Second example is of 102nd Indian Science Congress in Mumbai, in front of top most scientists in a symposium on “Ancient Sciences through Sanskrit” he said that India had jumbo aircraft that flew between continents and planets 9,000 years ago (some 4,500 years before Harappa and Mohen Jodaro). Message is very clear, when scientific fraternity can’t resist all this rubbish, a new science will be taught to young minds which will gradually convert them into a creature without any rational content and a mere follower, ready weapon for religious war. Education is not priority for any government at centre whether it UPA or present BJP government. That is reflected by the by the allocation for education in the successive central and state budgets. The 10% budgetary allocation and 6% of GDP expenditure on education continues to remain an elusive dream and tall claims of expansion in terms of numbers fall flat when we see the actual allocations, which have remained more or less stagnant in the absolute monetary terms. Same trend is also followed by the Modi led BJP government in their first general budget. The UGC has borne the brunt of a serious assault by the government with a drastic 32% cut even in absolute terms. Even after adding the allocation for the Rashtriya Uchcha Shiksha Abhiyan (RUSA) (a problematic scheme in itself) along with the allocation for the UGC, the fund cut amounts to nearly 5% in real terms. Technical education has suffered a 12% fund cut in real terms. Science education and research would suffer as the allocation for the Indian Institutes of Science Education and Research has been cut by 15%. The direct result of such fund cuts will be the deterioration in the quality of public education in the country, and can be seen only as a precursor to further commercialisation and privatisation of education, thus rendering education inaccessible to the vast majority of students in the country. Even in the revised budget estimates for year 14-15 government has reduced the funds on higher education to the extent of Rs. 3900 crore. Per student public expenditure on higher education in nominal terms has increased in the post-independence period but the real expenditure has registered a negative growth for the period from 1990-91 to 2002-03. States such as Tamil Nadu, West Bengal, Uttar Pradesh, Karnataka and Goa show consistent increase in expenditure, while Gujarat, Jharkhand, Maharashtra, Madhya Pradesh show declining expenditure. Political activism of students will always remain an essential part of a healthy university. University administrations should actively encourage student participation in university affairs. University faculties need to do more to cultivate critical and heretical ideas about the world we live in. And students need to participate actively in asserting their critical role in the university. Democratic rights of the students in the campuses are facing a very serious threat with the onset of the neo-liberal era. The Birla Ambani Report (2000) and the proposed Model Act for Universities during the tenure of the BJP-led NDA government viewed students’ unions as an impediment in the path of implementing the privatisation and commercialisation agenda. In the name of preserving the academic ethos, they took a stand against elections. Due to widespread opposition, both these initiatives were eventually dropped. Lyngdoh committee, in its report submitted on May 23, 2006 upheld the right of student organisations to work freely among students. It advised flexibility in the conduct of elections to students’ unions as per the requirements of different campuses. In fact, the Lyngdoh committee made it mandatory for all educational institutions, including private ones, to hold students’ union elections in some form or the other. However, most educational institutions in our country continue to ignore these basic recommendations of the Lyngdoh committee. Even at the stage of preparing its report, the committee anticipated this problem. It felt that certain state governments prohibit political activity or students’ union elections and that it would “be prudent for the central government and/or the Hon’ble Supreme Court to lead the way in the matter, and to impress upon the concerned state governments the need for a healthy student democracy, and, consequently, the need to amend any prohibitory statutes that may be in place.” Unfortunately, no proactive measure has been undertaken by the judiciary or the central government against the violation of this basic recommendation. Student union elections are currently held in only few states and 10 central Universities. Recently elections in Himachal Pradesh University and affiliated colleges have been banned. Erosion of the democratic rights of teachers and students has become an indispensable part of the neo-liberal assault on public education. We have to take this issue of democracy seriously in university centres. There is also a need to review the recommendations of Lyngdoh committee itself. This is the burning situation of Indian education system which is n more deteriorating in the BJP regime. Being a responsible students’ organisation it’s our responsible to take the challenge and organise students against these policies to wage a strong struggle. 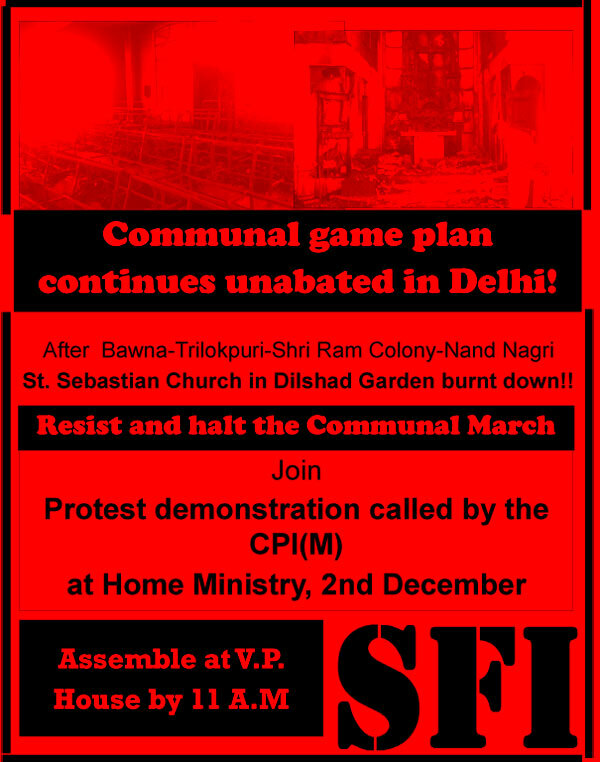 Keeping this in mind Central Committee of Students’ Federation of India will be organising a national protest on 26ht February at Parliament with a slogan “Combat commercialisation and Communalisation of education- Intensify Struggles”. THE Students’ Federation of India evolved through decades of ideological struggle and the organisation took the final shape in a four-day conference from December 27 to December 31, 1970 in Thiruvananthapuram. The Programme of the organisations was adopted on the penultimate day of the conference, and hence on December 30 this year SFI will be observing its 44th Foundation Day. Why I said ideological debate is because after Independence there was a debate regarding the nature of the policies of the ruling class which led to a serious rift in the student movement. After Independence, the new Congress regime adopted a capitalist path of development on the basis of a historic compromise with landlordism and imperialism. As a result of which, neither economic growth nor democracy could have a stable base in the country. In the area of education also there was some progress in post-Independence time but it was limited to a privileged few and large masses were denied of education and the constitutional directive for universal and compulsory primary education remained largely unfulfilled. A section of the student movement insisted on the then Congress regime, thus making the student movement tail the government’s policies. But a section of the movement stressed on the struggles for right of education and better education facilities against the government mobilising common students. This section of the movement which become a symbol of struggles and its strategy gained popularity among students become the leadership of the majority of students of India under the banner of the Students’ Federation of India. Our Programme explains history of the organisation – “The Students’ Federation of India inherits with pride the anti-imperialist, patriotic, secular, democratic, and progressive legacy of the Indian people’s struggle for national liberation from the British colonial rule. It carries forward the heritage of the progressive student movement of our country, which has always considered itself an inseparable part of the broader struggle for social transformation. 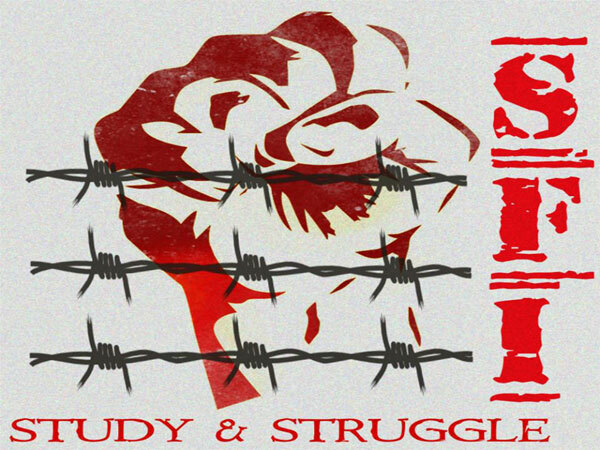 It is this legacy that the Students’ Federation of India holds aloft in its slogan of ‘Independence, Democracy, and Socialism’!” Since its inception, SFI is amidst struggles for student rights and better education system on one hand and ideological struggles on the other as the student movement is very prone to both kind of deviation whether it is right extremism or the left adventurism. 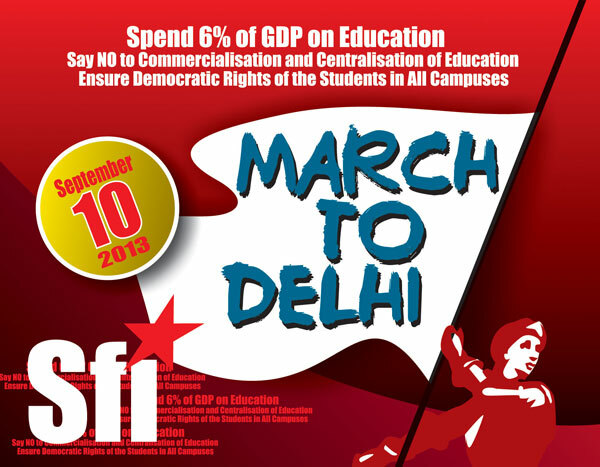 But it is the legacy of SFI to guide the country’s student movement to a right direction. Forty-four years after SFI’s formation when we are celebrating our Foundation Day it’s our duty to identify our strengths, weaknesses and our challenges. As far as strategic and ideological line is concerned the history has proved us right. 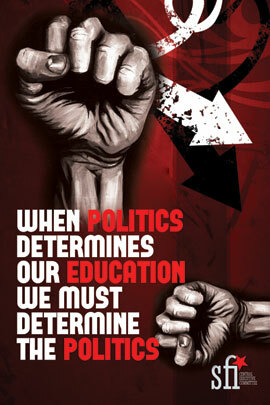 Our slogan of ‘Education for All and Jobs for All’ is still as relevant as when it was coined. Here we will concentrate only on one of the aim of the organisation narrated in our programme. 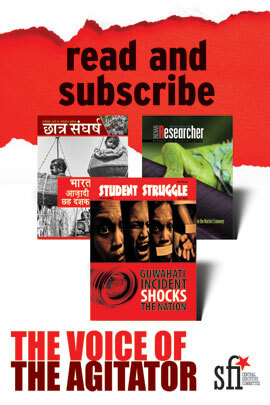 Our Programme says, “The Students’ Federation of India fights for the realisation of its aim to establish a democratic, scientific, secular and progressive educational system ensuring education and jobs for all that calls for the implementation of comprehensive land reforms, elimination of the stranglehold of international finance capital and indigenous monopoly capitalism. The Students’ Federation of India aims to accomplish this by organising the student community in the struggles of the wider democratic movement of the workers, peasants, and other progressive forces”. If we analyse this objective we can identify the present challenges of the education system and direction of the student movement. The slogan of “Education for All, Jobs for All” found a strong appeal with the student masses of the country, rallying them to the fold of the movement and the organisation and still has the same importance. This is because after six decades of Independence, the situation of India has not changed much. Even after continuous people’s struggles and enactment of the Right to Education (RTE) Act, millions of students still remain away from the sphere of education. Even minimum requirements of RTE have not been achieved even if we leave aside its limitations. The RTE Act had a number of requirements such as teacher-pupil ratio, teacher strength and infrastructure, which were to be achieved by March 31, 2013 but almost all of these couldn’t be achieved due to the government’s unwillingness to increase the public spending. A report in 2012 had estimated that more than 95 percent schools in the country don’t match the standards set by the RTE Act. Although enrolments have increased there is an increase in the enrolment to 96 percent for children in the age group of 6-14 years. But high drop-out rates is a problem that illustrates the ongoing inefficiencies in the system. While around 27 per cent children drop out in grade V, around 41 per cent of students drop out in grade VIII. Census data suggests that up to eight crore children are out of school (GOI, 2013). In all these years there is massive privatisation of education and interestingly the pace of privatisation has increased even after implementation of the RTE Act. In 2005, all India rural private school enrolment was 17 percent, which rose to 29 percent in 2013. Apart from expenditure on private schools, the expenditure on private tuitions has also increased. This clearly shows the deteriorating condition of school education in the country. The situation can be understood only by the vacant posts of teachers in primary and upper primary schools, where 12.59 lakh teachers’ posts are vacant. The story is same in the higher education sector where even more rapid privatisation and profit making is happening. India’s gross enrolment rate (GER) in higher education is 19.4 percent which is below the world average of 29 percent (as of 2010). There is an increase in the number of institutions of higher education. From 26 universities and 695 colleges at the time of Independence, we have grown to 700 universities and 35,53,912 colleges today. This is a 20-fold and 46-fold increase in the number of universities and colleges, respectively. However, as the low GER very aptly indicates, increase in the number of institutions has still remained inadequate to meet the increased demand for higher education. There is huge faculty crunch in all the universities. Forty-two central universities with sanctioned faculty strength of 16,602 have 6,542 vacancies. Same is the case of other institutions. Fifteen IITs have 1,611 vacancies against the total strength of 5,092 faculty positions, Thirteen IIMs have to fill 111 vacancies out of 638 positions, Four Indian Institutes of Information Technology have almost 50 percent vacancy as 104 out of 224 positions are vacant, National Institutes of Technology across 30 states have 1,487 vacant of the total 4,291 positions. Even less than a decade-old Indian Institutes of Science Education & Research with five branches has been afflicted with faculty crunch - 131 vacancies out of the total strength of 518. The student-teacher ratio in India (24:1) (including IIT/IIM) is very low as compared to other countries, 9.5:1 in Sweden; and 13.6:1 in the United States. Consequently, the culture of questioning and reasoning cannot be inculcated as a part of most of universities. With respect to GER in public, private and private unaided institutions, estimates from the NSSO highlight that 46 percent is in the public space, while over 50 percent is in the private (aided & unaided) space. While private players do bring investments in higher education, there is always the danger of dilution of quality and over-commercialisation of education. It is important to note that the higher education system in India is more privatised compared to other capitalist or market economies, for instance, the US, the UK, Canada and Australia. In the US, one-fifth to one-fourth of the total number of students in higher education, and about 30 percent of the global enrolment in higher education, are in private institutions; the remaining students go to public universities. On average, only 15 percent of the enrolments in the tertiary education system in the Organisation for Economic Co-operation and Development countries, and a meagre eight percent in the countries of the EU, are enrolled in independent private institutions, with a vast majority everywhere studying in the public sector. In contrast, in India, 66 percent of students in general education and 75-80 percent in technical education are enrolled in private, self-financing institutions (Planning Commission document, 2013). Higher educational institutions in the country are increasing financial burden on students. This has been mainly due to fee hike and reduced funding for higher education. Students are increasingly being made to bear the burden of rising costs of education and stagnant scholarships/fellowships. Due to rampant privatisation and inadequate public sector most of the potential youth is not able to get the strength of higher education. India is one of the youngest nations with potential human resource available. According to International Labour Organisation (ILO) estimates, by 2020 India will have 116 million workers in the age group of 20-24 years as against 94 million in China. In addition to this, the average age of Indian population by 2020 will be 29 while many developed countries will be in early or late 40s. To take advantage of the large human resource (indeed, to prevent socio-economic complications arising out of a large unemployable young population), this massive workforce would need to be gainfully employed. But employment for all is still far away from imagination. Policies adopted by successive governments resulted in jobless growth. Same trend still continues. ILO has said in its recent report that the unemployment scenario in India over the last two years has been showing a rising trend. If we analyse the unemployment trend of last three years only we will find that unemployment rate in India is showing an increasing trend since 2011 when it was 3.5 percent. The same rose to 3.6 percent in 2012 and climbed to 3.7 percent last year. This year, jobless rate is expected to rise to 3.8 percent, according to the report 'Global Employment Trends 2014'. The biggest worry is the growing informal employment which counts for 94 per cent of the workforce and is growing faster than formal employment. According to the ILO report only 21.2 percent of working men (aged 15-59) had a regular salaried job (in 2011/12 period). The unemployment rate is also very high among educated youths of India. According to Labour Bureau's “Third Annual Employment & Unemployment Survey 2012-13”, one out of three graduates is unemployed in India. In spite of all its limitations and corruption, MGNREGA is giving some relief to the unemployed youths but the BJP government is trying to subjugate it. So the slogan of ‘Education for All, Jobs for All’ has to be championed among students. This objective has always attracted me personally. To ensure a democratic, scientific, secular and progressive educational system is our aim. These words ‘democratic’, ‘scientific’, ‘secular’ and ‘progressive’ are very important and should be understood in totality. In the present scenario when the NDA government led by RSS is doing all sort of ‘Manuvadi’ and ‘Hinduvadi’ experiments with education, these words become all the more important. The education system should be democratic in the sense that participation of students, teachers, parents and community should be there in teaching-learning process and the teaching-learning process should encourage democratic values among students. But Indian education system runs only on the principle of pass percentage and grades. Mechanical cramming is there to gain high scores in this age of cut-throat competition. Intersects and potentials of the students don’t have any role to play. Nowadays even choice of courses is done on the basis of its market value but not on the interest of student. A big coaching industry is growing which ensures high percentage, admissions and success in competitive exams. In this market-run economy, parents are seen only as source of fees and they have only this limited role to play. Even in government schools assessment of teachers is done on the basis of merits and teachers are also involved in innovations to improve pass percentage, instead of innovations related teaching methodologies. Meaning of ‘scientific education’ is to inculcate a scientific outlook and values among students to encounter the real life situation. But this aspect has always been ignored in our schools and higher education. Interestingly on many instances teachers and our educational leaders encourage unscientific attitude. When we are teaching a student that moon is satellite of earth and at the same time encouraging him to celebrate ‘Karva Chauth’ or inspire them to pray to god for good results from where this scientific attitude will develop. There have been efforts to introduce astrology as a science and the present government is also working on this aspect. When our Prime Minister is saying that Ganesha is creation of surgery and Karna of genetics and the same PM is addressing schoolstudents on various national days, how these growing minds can understand scientific values. There are various incidences of caste discrimination in our schools and on many instances teachers are involved in these incidences. 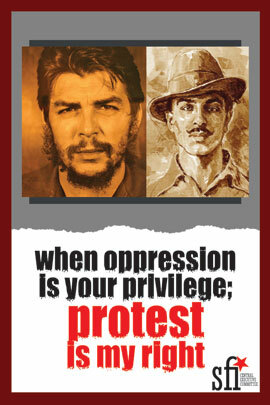 Recent incident of Rajasthan is still fresh in our minds. When students are witnessing all this feudal values in their families and schools how progressive education can be ensured. We are teaching them caste discrimination, gender bias, area biasness, colour discrimination, etc and hoping to develop a progressive society which can solve problems of inequality of our society! There was a discussion in Parliament on the ownership of ‘Taj’- the symbol of love. Love doesn’t have any religion. And people, our MPs are claiming that it belongs to the Hindu community. There is an advocacy to teach part of the Gita in all classes and recently to declare it as a national holly book. Persons like Dinanath Batra are deciding the syllabus of our kids, which will be telling them that all Muslims residing in Hindustan are Hindu. In this scenario, how we can hope that education is imparting secular values to the younger generation. In the last six months, a series of developments are there which can be cited here but it will take space of another full article. To conclude the objective of SFI to ensure democratic, scientific, secular and progressive educational system is very important to build an India which can resolve problems of all type of discrimination and feudal values. Only the citizens having democratic, scientific, secular and progressive values can lead to an egalitarian society and can contribute to national development. Mere beating the drums of glory of our past can’t serve the purpose. SFI is always in struggles to achieve these objectives. Be it the attacks on education system or the attack on the national integrity out brave soldiers are in the forefront in the struggles. Our history is the history of sacrifices. 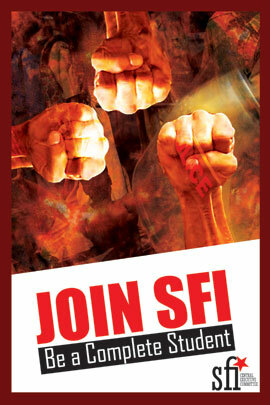 It is only SFI, whose leaders are martyred in struggles of students in independent India. 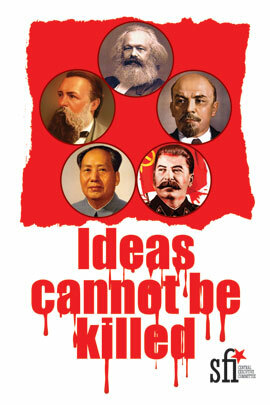 We dare to call upon our enemy after each sacrifice ‘you can kill our comrades but you can’t kill our ideas’. But a lot has to be done. With the changes in the political and economic scenarios, challenges of student movement are also changing. It’s duty of our brave comrades to analyse the concrete condition and prepare for new struggles with new approach. With a government at the Centre which is committed to make big changes not only to further commercialise education but to communalise it also, then its need of the time to do extra efforts to organise students in campuses, where more aggressive attacks will be there on democratic rights of students. We hope on this 30th December, when we celebrate the Foundation Day of this progressive student movement full of sacrifices, we will take a vow to carry forward the legacy of study and struggle in all campuses across the length and breadth of the country. Modi, like a colossus, straddles India. His triumphant ride from Gujarat to Delhi supersedes the Rath Yatra of Advani – he seized the throne, while all Advani could do was leave blood in his wake. Modi has vanquished India. His acolytes say that whatever happened in 2002 in Gujarat is in the past. The future is in Development. (1)Eviscerate labor laws. “Track 1 reforms require, first and foremost, the reform of India’s labor laws,” writes Panagariya. “Highly rigid labor laws have made entrepreneurs terrified of hiring workers.” Since the 1990s, the courts have whittled down the right to strike and other protections given to workers. But Modi’s Development requires more. It requires freedom for capital to fire labor as well as freedom for capital to declare bankruptcy and liquidate its labor force. (2)Expand Privatization. The BJP’s Vajpayee government had set up a Ministry for Disinvestment, with the great warrior of the Right Arun Shourie in the minister’s seat. He went a long way toward the asset stripping of Indian industry. The Congress-led UPA was too embarrassed to do the job with such brazenness. It chose more refined ways to do the same kind of thing. Panagariya thinks the Congress simply didn’t go fast enough (besides in 2006, the UPA had to shelve its disinvestment program after the DMK felt smarted by the Neyveli Lignite deal). He wants more. “The government must restart efforts to privatize public-sector enterprises, especially those engaged in such activities as manufacturing fertilizers, chemicals and electronic and engineering goods.” Little divides the UPA’s Montek Singh Ahluwalia from Panagariya. It is merely that the BJP government is not hamstrung by the wiles of the regional parties or the ideological opposition from the Left. (3)Privatize Education. 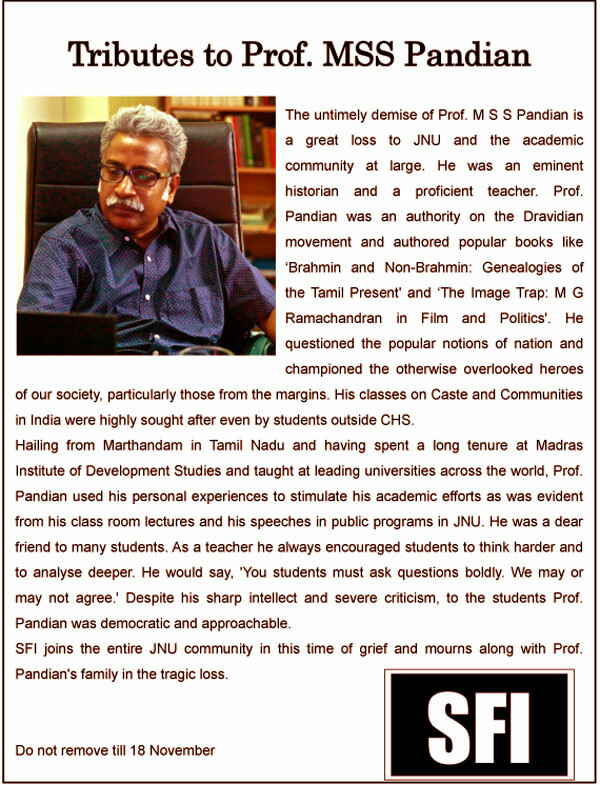 One of the most serious gestures made by Panagariya has been his call for the privatization of higher education. In June 2014, he wrote that the government “should abolish such government bodies as the University Grants Commission, which set and enforce standards for all Indian universities.” There is a need, he wrote, for the government to “end its own bureaucratic stranglehold on the university system.” What would replace it? Some modest regulation of a largely fee-for-service educational industry. In essence, the mechanism to end poverty – which Modi has said is his major goal – is by freeing up the private sector to create jobs. The policies that Modi wants to install in India are precisely what have created a drought in global employment, according to the International Labour Organisation and the UN Conference on Trade and Development. Modi has said that it is poverty that he wants to fight, that social suffocation of India’s diversity is not his goal. Nonetheless, Modi’s election has strengthened the forces of suffocation, who now give full vent to their ludicrous yet dangerous ideology. There is always a whiff of fascism that hangs over the BJP’s allies. From Muzaffarnagar to Muzaffarpur, from the rhetoric of Varun Gandhi to Niranjan Jyoti, the evidence of this intolerance is evident. But these epigones of Modi are not new to the Indian stage. Advani would froth from the mouth during his Ramjanambhoomi campaign, as would Vajpayee in his Goa speech in 2002 (“Wherever there are Muslims, they do not want to live with others. Instead of living peacefully, they want to preach and propagate their religion by creating fear and terror in the minds of others”). The emotional register of the BJP and its Sangh Parivar is viciousness – it cannot speak without bearing its fangs. Reading about the BJP can be monotonous. Most of the literature concentrates on the biliousness of its leadership – the kind of statements made by them, the awful positions they take on social and economic issues. There is a tendency to believe that if one merely exposes the kind of views of the BJP and the Sangh Parivar, the population will come to its senses, abandon them and flee to more liberal political parties. Such a view asserts that the people are deluded. But is this a sufficient analysis of the current situation, particularly when the BJP and the Sangh Parivar are quite willing to broadcast their most offensive ideology to the widest audience? Shouldn’t we have a deeper sense of the social processes at play that attract the forces of neo-liberal Hindutva? What are the classes that are drawn to the BJP, which caste fragments find their politics appealing? What are the ruling class sections that have given themselves over to the BJP, and not just those who are with the BJP now and would – opportunistically – be with the Congress later? More research is needed, surveys of the mohallas of UP where the BJP has been able to establish itself, surveys of the provincial college campuses where its student wing has been able to secure a base. Such work is essential. It would teach us how to better confront the Sangh Parivar. We cannot defeat the Right by being horrified by it. Patient assessment of its strength and patient work to build our own ranks are both essential. 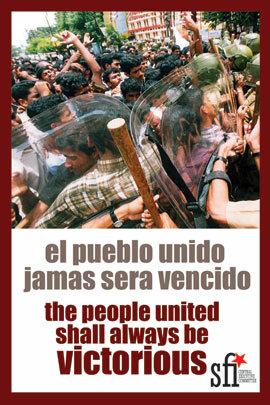 Unities of the popular classes have to be built as the only antidote against the Right. But these unities cannot be built on wishful thinking alone. They require hard work and hard thought. They require the kind of labor unity that could be glimpsed in the nation-wide coal strike and the local stoppages in different sectors; the kind of alignment of women’s groups and agricultural workers’ groups against the destruction of rural employment. These are bold maneuvers to build popular confidence and a popular will against neo-liberalism and Hindutva. The only real alternative vests in the growth of a united and bold Left. Anything else is palliative. Vijay Prashad is the Chief Editor at LeftWord Books. He is the author, most recently, of No Free Left: The Futures of Indian Communism (LeftWord, 2015) and a columnist for Frontline, al-Araby al-Jadeed and BirGün. IT was a scenario of great zeal and enthusiasm when a procession of shouting slogan students, with flags in their hands, hit the busiest roads of the historic city of Aurangabad in Maharashtra. They all were assembled here for the open session of the 15th Maharashtra state conference of Students Federation of India (SFI), which took place from January 3 to 6. The public meeting that followed in Tapadiya Natya Mandir was addressed by former SFI general secretary Nilotpal Basu, former SFI vice president Dr Ashok Dhawale, former state joint secretary Dr D L Karad, SFI president Dr V Shivdasan and SFI state secretary Vinod Govindwar. State SFI president Bhausaheb Zirpe presided. While addressing the public meeting, Nilotpal Basu described how the ruling class parties are fighting on who will be the next prime minister while the actual need today is to change the policies. Dr Ashok Dhawale, at present the secretary of Maharashtra state unit of the CPI(M), dwelt on the destructive role of the Congress led government at the centre as well as in Maharashtra. He spoke about the increasing unemployment and the growing inaccessibility of education for the poor. He sharply criticised the communal and sectarian forces too in the state. He stressed the need to unite against all such forces. Dr D L Karad spoke about why the students movement should move hand in hand the with the working people’s movement for a change of policies. Bhausaheb Zirpe, in his presidential speech, described the SFI as a university where one gets a degree in struggles. We must continue our struggle by taking this degree, he added. On the next day, the inaugural session was held at Govindbhai Shroff Hall where the state SFI president Bhausaheb Zirpe hoisted the organisation’s flag. Amid loud slogans, the delegates and leaders saluted the flag and paid homage at the Martyrs Column, before entering the hall. The hall was named after Dr Narendra Dabholkar, a martyr, and the stage was named after martyred SFI comrade, Sudipto Gupta. Reception committee chairman and well known political analyst Jaydev Dole welcomed the delegates to the historic city of Aurangabad and thanked the state SFI unit for organising the conference in the city. Former police commissioner of Aurangabad city, Uddhav Kamble, inaugurated the conference. The session concluded with the address by Bhausaheb Zirpe. A presidium comprising Bhausaheb Zirpe, Mohan Jadhav, Balaji Kaletwad and Manjushri Kabade was elected to conduct the proceedings of the conference. The steering committee comprised Vinod Govindwar, Datta Chavan and Shrikant Bhosale. A resolutions committee, a minutes committee and a credentials committee were also elected. State secretary Vinod Govindwar placed the condolence resolution, whereafter the delegates paid homage by observing two minute silence. State secretary Vinod Govindwar placed the draft political and organisational report which, after dealing with the ongoing international and national developments, pointed to the poor status of education and its availability in the state and the apathy of the state government to release the funds for education. He also mentioned the major activities taken up by the organisation since the previous conference. These included activities to oppose the private universities act and the holding of a large rally of students and youth on November 29, in cooperation with the DYFI, on the issues of education and employment. This year saw a big success in mobilisation of students. The report also discussed the recommendations of the Lingdoh committee for student union elections. In its organisational part the report noted that though there were signs of improvement in some districts, shortcomings still persisted. Regular attendance, participation of members in deliberations, regular check-up and criticism as well as self criticism will ensure the proper functioning of the state unit, the report asserted. Delegates from all the districts spoke on the report for about four hours. Apart from sharing their experiences gained while doing work in their respective areas, they mentioned the problems they are facing and various ways they adopted to deal with them. The delegates resolved to build up struggle against the current policies by taking up the local issues and to consolidate the organisation. A special session was conducted after that. Dr Ashok Dhawale spoke about the qualities required in an organisation leader --- that he needs to be soft-spoken, clear, cool-headed and inclusive. He also spoke about Shahid Bhagat Singh’s passion for books and his consistent effort to gain knowledge. These are the qualities that leaders should imbibe. This will strengthen the organisation and help us in facing the opposition. A total of 12 resolutions were moved at the conference. These were on opposing the opening of private universities and on strengthening the government universities, on the recommendation by the Lingdoh committee, on the need to fight for various facilities in tribal students’ hostels and schools, on taking the organisation to private and professional education institutions, on the need to oppose the communal and sectarian forces, on the need to oppose social injustice in the form of caste panchayats and honour killing, on strengthening the struggle against gender based violence, on the demand for increases in scholarships and freeships for EBC students. All these resolutions were adopted unanimously. Balaji Kaletwad put forth the credentials report which stated that a total of 185 delegates came from 17 districts; among that 44 were girls. About 10 delegates were attending the conference for the first time that indicated that a new team is getting ready to take the struggle forward. The conference unanimously elected a 31 member state committee which in turn elected a 10 member secretariat, with Mohan Jadhav as president and Datta Chavan as secretary. A passionate felicitation programme was held for the outgoing state SFI leaders that included Bhausaheb Zirpe, Vinod Govindwar, Shrikant Bhosale, Seema Jivrag, Sarita Sharma and Prashant Vidhate. The newly elected state president, Mohan Jadhav, expressed gratitude for the Aurangabad district units of the SDI and other mass organisations for the all-out efforts they made for the success of the state SFI conference. The conference concluded with a rendering of the Hindi version of “We Shall Overcome,” which all the delegates sang in unison before leaving with a determination to strengthen the organisation and forging more struggles in the coming days.